We are very fortunate to have foundation animals from Castle Rock Farm. ADGA pedigrees can easily be retrieved by clicking their name. Other names linked here will lead you to a photo/description. We offer stud service for $75/bred doe. Does purchased from us can be bred 1 time for free, provided they test negative for CAE within 30 days and you have a history of negative tests for all goats that have been at your farm. Please do your best to bring your doe when she is in optimal health to ensure she will settle (become pregnant). Good body condition and daily access to quality minerals is key. We also recommend copper (via bolus) & selenium (Bo-Se via injection) throughout the year and especially at the beginning of your breeding season. Moon Boots was purchased because there is great consistency among his dam’s progeny, including SGCH Castle Rock Moon Beam EEEE 92 and Castle Rock Moon Raker (that reside at CRF) and SGCH Castle Rock River of Rain 1*M VEEE 90 (who we own). 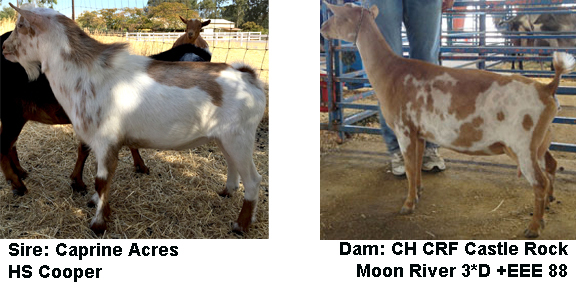 Moon Boots is by a very dairy buck, out of an EEEE 92 doe and by an EEE91 buck owned by Caprine Acres. Moon Boots is quite angular and dairy, long and level, great width between the hocks, high in the escutcheon and great spacing between his ribs. He is incredibly charming. If you want to know why I co-own Castle Rock Roxstar , he’s a Roxanne buck. That’s enough. Oh, you aren’t sure you know which doe this is, odds are, if you’ve shown in Northern California, you’ve been amazed when this buckskin beauty enters the rings. 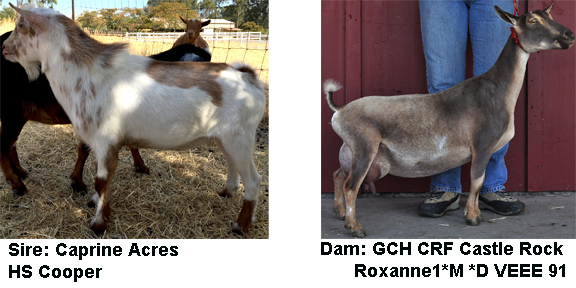 The judges have been impressed too, here’s the recap: 3xGCH, 4xRGCH, 21xBOB, 14xBest Udder, 1xBest Udder in Show. 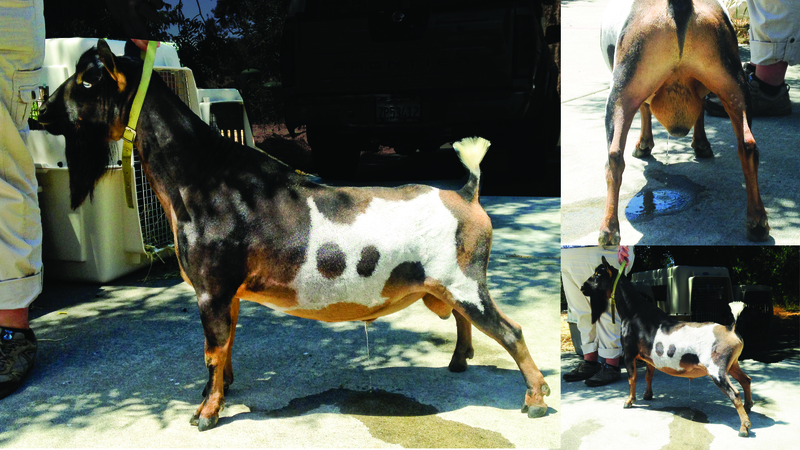 Third place aged doe, second place udder, ADGA National Show 2015. 2015 & 2016 Elite Sire List! As of July 2016, Cleveland has 7 finished champions, 5 of which have also earned Superior Genetics. Many of those same does have earned a Best Doe in Show as juniors. This buck has proven his worth, time after time with his daughters, and sons. It’s not too often that you see such consistency in udder correctness, capacity and particularly teat size and placement. His dam’s near ideal teats keep getting passed along, the length of body, the level topline, I could go on and on. When his daughters made an appearance at the 2015 National Show, they went on to take a 2nd place Get of Sire, as well as high placings in their classes. In 2016, my 3 Cleveland does took a first place Get of Sire at the Alameda County Fair. I love, love, love everything this buck has done for the breed. Hats off to Sarah Hawkins at Castle Rock Farm for breeding such a wonderful buck. Clark and Castle Rock Guy Noir (with 4 finished daughters) share the same dam. His sire has 5 finished champions. From the beginning, Clark looked like a shrinky-dink version of an adult goat, seeming to never go through any awkward growth stages unlike many kids. He has a good front end assembly, lots of space between the ribs, strong topline, and a high, wide escutcheon arch, all set on a good set of feet and legs. To top that off he has a great personality. Clark now resides in Rio Vista, but we’ve retained 5 of his daughers. All 5 daughters have their dry leg, in addition to many reserves.